What would you sacrifice to protect your way of life? In the sixteenth century, a young nun risks everything to defy the most powerful authorities, fulfill a prophecy, and preserve the future of Christendom. Joanna realizes the life of Henry VIII, as well as the future of Christendom, are in her hands—hands that must someday hold the chalice that lies at the center of these deadly prophecies. . . .
"Rarely have the terrors of Henry VIII's reformation been so exciting. Court intrigue, bloody executions, and haunting emotional entanglements create a heady brew of mystery and adventure that sweeps us from the devastation of the ransacked cloisters to the dangerous spy centers of London and the Low Countries, as ex-novice Joanna Stafford fights to save her way of life and fulfill an ancient prophecy, before everything she loves is destroyed." 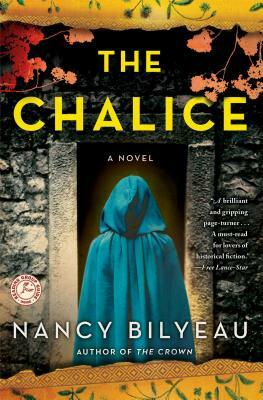 "Superbly set in the political and religious turmoil between Henry VIII's queens Jane Seymour and Anne of Cleves, The Chalice is a dark, twisty thriller that I couldn't put down. Nancy Bilyeau's extensive historical research makes the sense of dread, danger, and mysticism permeating this era tangible. Ex-Dominican novice Joanna Stafford is an especially compelling and sympathetic heroine—I adored her!"